This was the winning entry in the Iron Chef competition that was part of the AsparaBUS tour on May 26th. Feeds 4 as an appetizer. Wrap the slices of prosciutto around the salmon and set aside. Have a large bowl ready to add all the vegetables. Shave or slice thinly the asparagus and fennel. Add to it the parsley and fennel fronds roughly chopped. In a small bowl mix together the mustard and vinegar. Slowly drizzle in olive oil while stirring to emulsify it. Add salt and pepper to taste and toss into vegetables. Let rest. Add 1 tablespoon of canola oil to a non stick frying pan. Once hot add the salmon and crisp on all sides. Approximately 2 minutes per side. Remove from pan and cover lightly with foil to keep warm. Wipe pan and add the last tablespoon of canola oil. Add potatoes and a teaspoon of salt and pepper. Crisp the potatoes. In the middle of each plate add 1/4 of the salad and try to make a tight mound. Place 1/4 of the potatoes around each plate randomly and then top with 2 pieces of the salmon. Serve and enjoy. 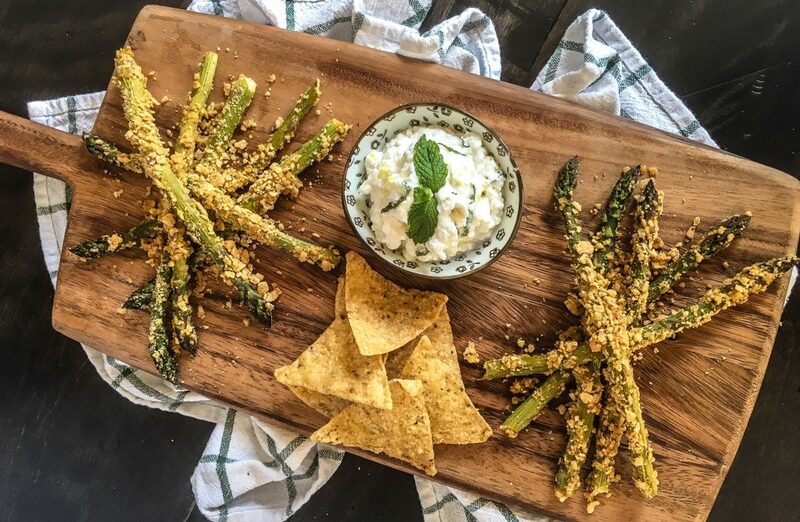 Here are some more delicious asparagus recipes. Preheat oven to 375F. Butter a 8 inch spring form pan and set aside. In a small saucepan, heat oil over medium heat. Sauté the onions until translucent and tender about 2-3 minutes. Set aside. In a large bowl, add the asparagus, spinach, parsley, green onions, cooked onions, feta, halloumi and beaten eggs. Season with salt and pepper and toss gently until well mixed. Set aside. Combine the melted butter with the olive oil in a bowl. Place phyllo between a damp tea towel, this will ensure it does not dry out. Layer 8 sheets of phyllo in the pan. Using a pastry brush, brush each with melted butter. Fill with spinach mixture and fold edges over. Layer 8 more sheets of phyllo, brushing each with melted butter. 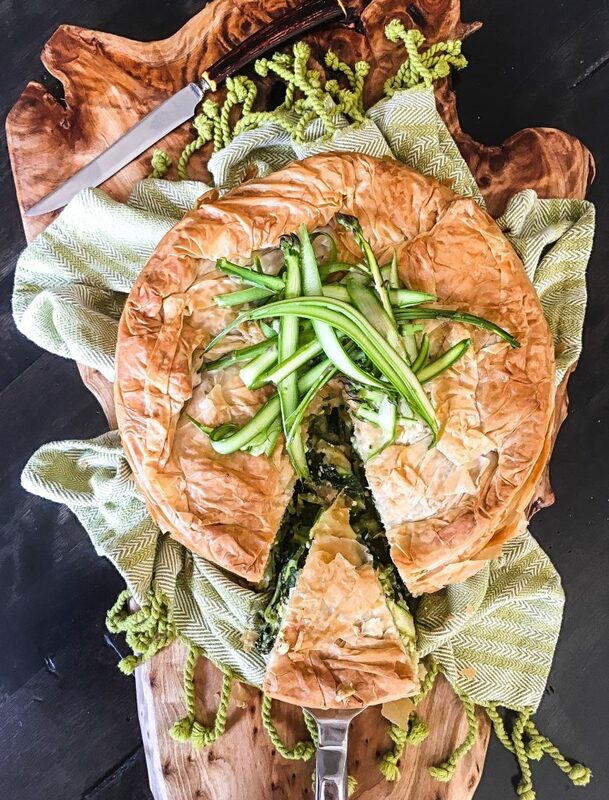 Ensure the sides of the phyllo are tucked in the spring form pan. Bake for 35-40 minutes or until golden in colour. Remove from oven, allow to cool for 15 minutes prior to removing from spring form pan. Preheat oven to 400F. Line a large baking sheet with parchment paper and set aside. In a food processor, blend enough chips to make 1 cup of bread crumbs and put on a large plate. Place Dijon mustard in a bowl and set aside. With a pastry brush, brush each asparagus spear generously with Dijon mustard. Roll in chip crumbs and place on lined baking sheet. Repeat with remaining asparagus spears. Ensure asparagus spears are spaced and not touching each other on baking sheet. Bake for 10-12 mins until golden and crispy. To make dip: In a bowl of a mixer with a whisk attachment, whisk ricotta until creamy, about 2-3 mins. Add remaining ingredients and stir well. 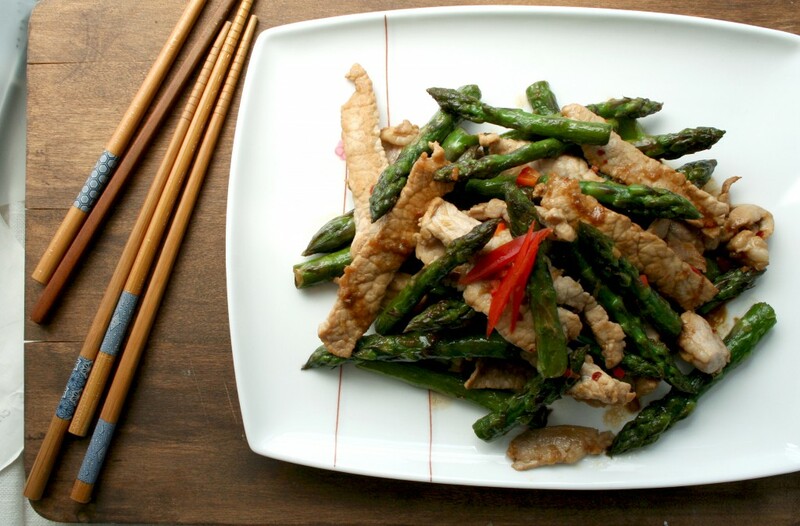 Serve with warm asparagus spears. 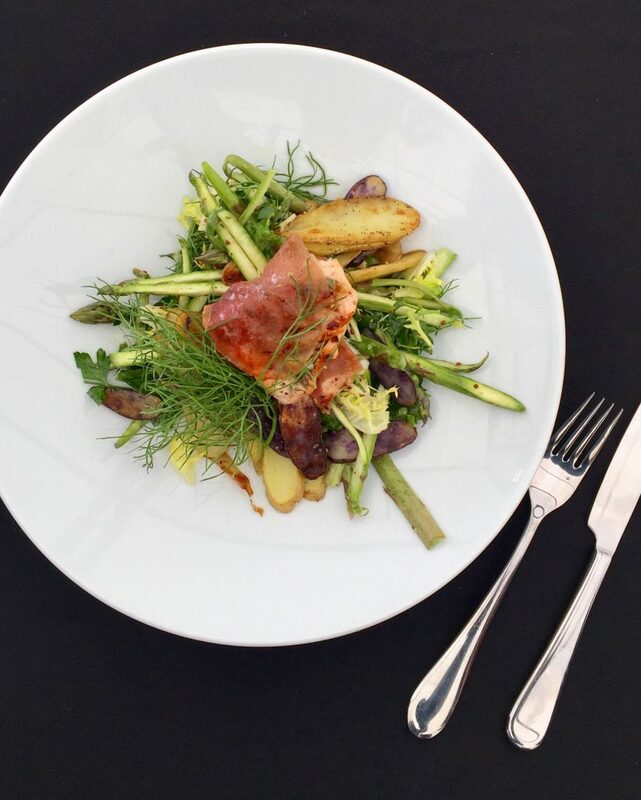 These recipes were developed for us by Chef Jonathan Collins of Collins Cuisine. CTV recently featured several of our recipes. They made a nice video showing their preparation. 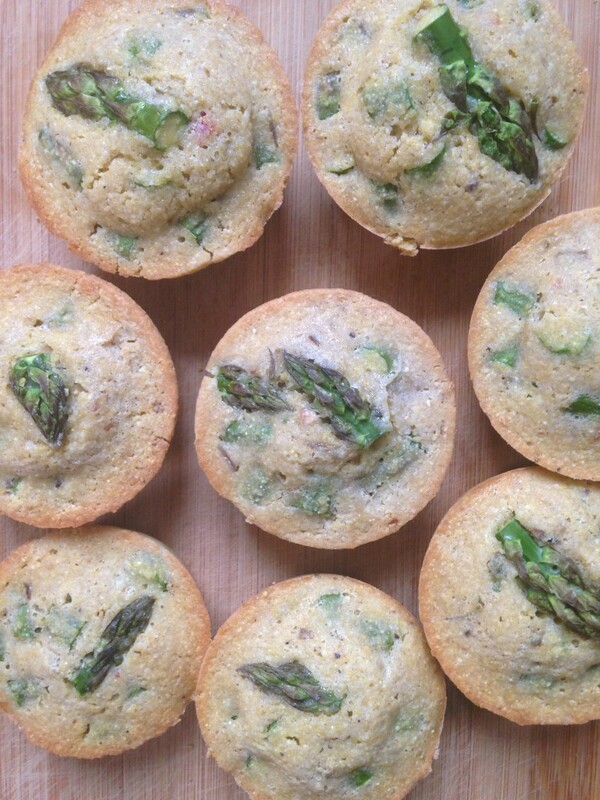 Here are some additional asparagus recipes of our own making. Yields 2 mains or 4 sides. Gently steam asparagus. Mix all ingredients minus the asparagus. Taste and season accordingly. 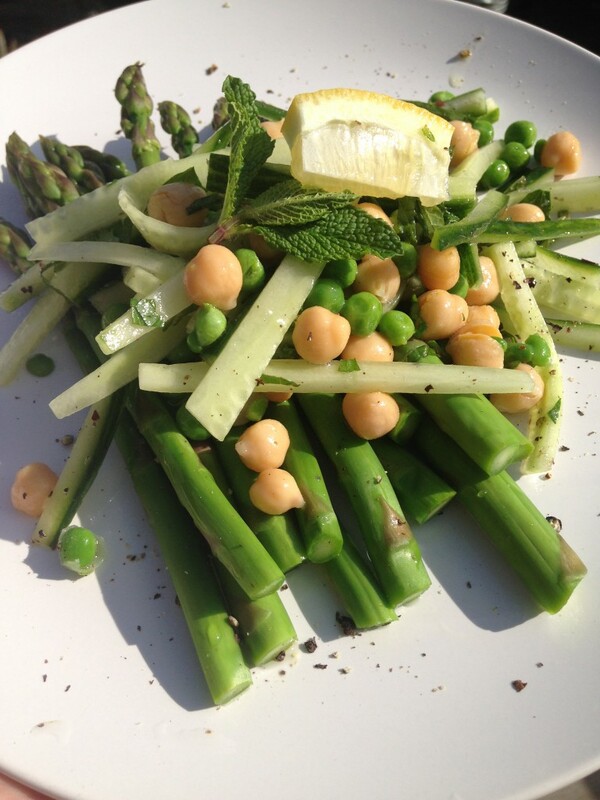 Arrange asparagus on plate and then place the mixed salad atop. Finish with fresh mint and lemon wedges. Perfect accompaniment to shrimp, chicken or great with goat cheese! Photo and recipe by Rachel Bies. 1 bunch of asparagus, chopped BUT save tops for garnish. Preheat oven to 350 and coat muffin tin with coconut oil. Mix all wet ingredients together with peppers and asparagus. Mix dry ingredients together thoroughly & slowly incorporate into wet batter. Pour into muffin tins approx. 1/4 full. Finish with aspara-tops. Bake for 15/20 minutes until golden. Good for up to 4 days fresh OR freeze for a couple weeks. Great with a fried egg, with preserves or what we did at home is use for sloppy Joe’s using Walter All Natural, Craft Caesar Mix. 1 1/2 teaspoons Lemon Juice or to taste, optional. Submerge a food safe cedar plank in water anywhere from 20 minutes to 4 hours, depending on the thickness of the wood and your timing. Preheat the barbeque grill over a medium high heat. Wash and trim asparagus, place in a bowl and drizzle over balsamic vinegar and 1 Tablespoon of the olive oil. Place the asparagus on the cedar plank on the barbecue. Reduce the heat to medium and close the lid. Grill for about 10 – 15 minutes, checking intermittently until tender. Have a glass of water or spray bottle handy to extinguish any possible flames along the cedar plank. Meanwhile, heat the remaining tablespoon of oil in a large stockpot to medium, add the leeks and garlic sautéing until soft and translucent but not browned; about 3 – 5 minutes. Add the diced potato and cover with the stock. Bring to a simmer and cook until the potatoes are softened. 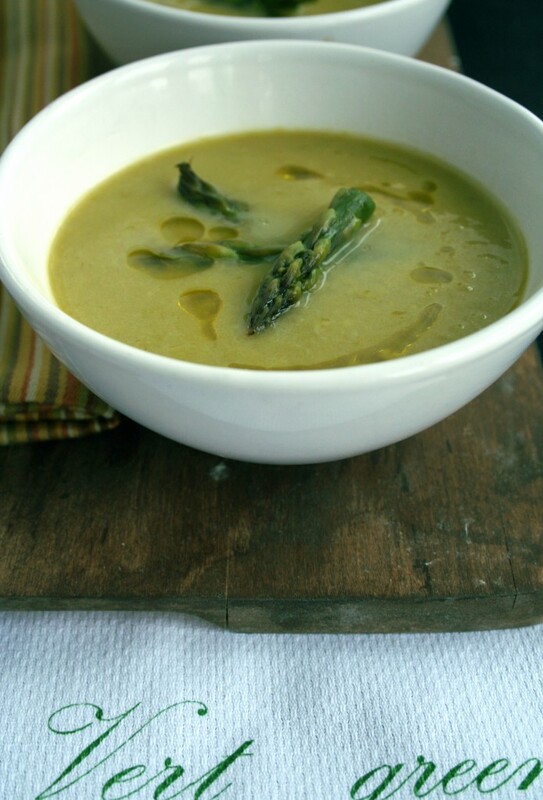 Remove the best spear tips from the cooked asparagus and reserve for garnish.Roughly chop the remaining smoky asparagus, add to the simmering soup. Continue for another 3 – 5 minutes to cook through to merge flavours. Transfer soup to a food processor or using an immersion blender, combine until smooth. Season to taste with salt. Stir in lemon juice. Clean the asparagus, snap woody ends, drizzle over olive oil and season with salt and pepper. Preheat the grill to medium. Add asparagus, flip after 3-4 minutes and grill the other side, moving any skinny spears to the top rack as necessary. Cool and remove the asparagus tips and reserve. Finely dice the stalks. Fry the bacon over medium heat, turning regularly until crisp, about 6-8 minutes. Remove, cool and finely dice the bacon. Reserve the drippings. In a large bowl, combine the cornmeal, flour, baking powder, salt, garlic powder and cayenne pepper. In a separate bowl, whisk the milk and egg together. To it, add the crumbled feta, half of the diced bacon, 2 tablespoons of the bacon drippings, the green onion, and the diced asparagus. Combine the wet mixture to the dry and stir well, leaving no dry clumps. Heat a large frying pan to medium. Add half of the remaining bacon drippings back to the pan and enough oil to thinly cover the bottom of the pan. Gently drop the mixture by tablespoons onto the hot oil. Cook each side for about 2-3 minutes, or until golden and firm. Set on paper towels to absorb any excess grease. Repeat with more bacon drippings and oil for the next batch of batter. 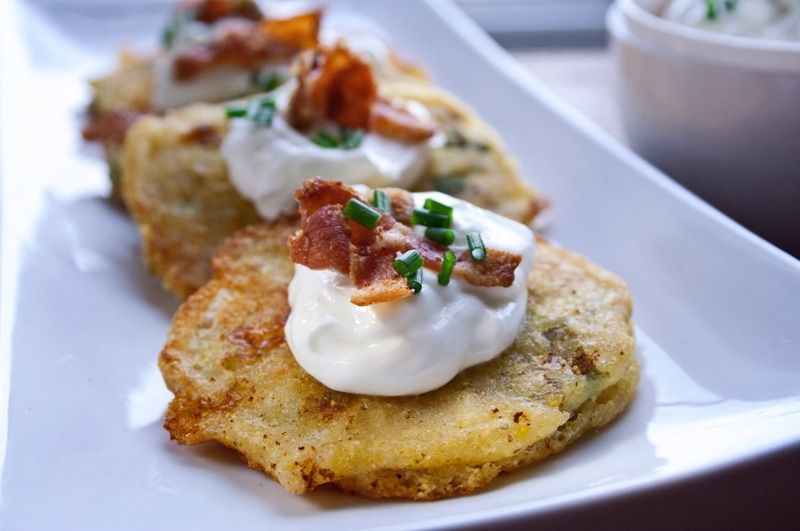 Serve corncakes with a dollop of sour cream, a reserved asparagus tip and the remaining crumbled bacon, if desired. Toss together the sorrel and arugula leaves and spread out onto a serving platter or salad bowl. Slice the fennel and the apple as thinly as possible. Cut the sliced apple again into matchsticks. Add to the greens. Snap woody ends of the asparagus spears and wash well. Working with 1 asparagus spear at a time, use a vegetable peeler to cut spears into long, thin shavings. 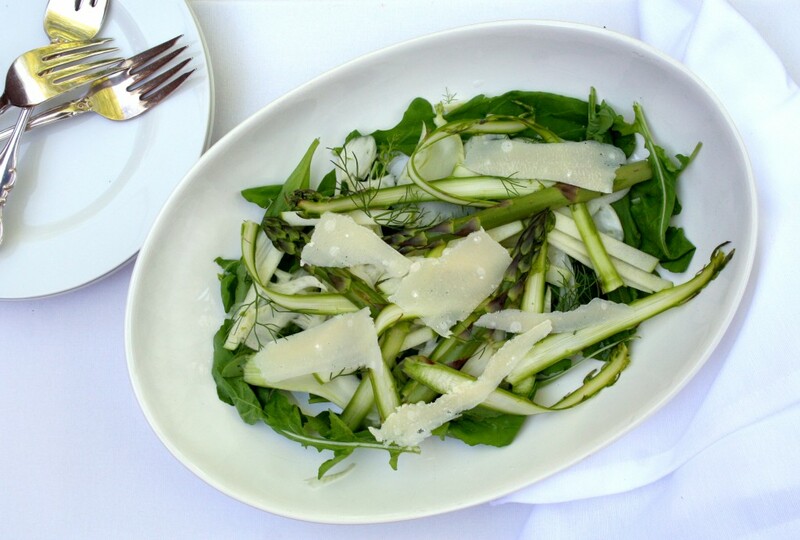 Top the salad with the shaved asparagus. In a small bowl or a mason jar with a lid, combine the apple cider vinegar, lemon juice, olive oil, honey, mustard, salt and pepper. Whisk or shake well in the jar. Taste and adjust salt and pepper as necessary. Pour over prepared salad. Sprinkle over diced chives, reserved fennel fronds and with the vegetable peeler, slice over long parmesan shavings to serve. Snap each of the cleaned asparagus spears in half. Heat a large frying pan over medium-high. Add 2 tablespoons of the sesame seed oil and add the asparagus pieces. Keep the asparagus moving, tossing for about 3 minutes. Add the sliced pork, soy sauce and the remaining sesame seed oil. Stir frequently to cook the pork on all sides, about another 2 minutes. Add the ginger, garlic and chilies; toss everything together, cooking for an additional 3 minutes. Preheat the grill to medium. Add asparagus and the marinated flank steak. Flip everything after about 4 minutes. Watching not to char the smaller asparagus ends. Allow the steak to cook approximately 10-12 minutes to medium-rare. Let the steak rest. 5 minutes before slicing thinly. Warm the tortillas on the grill, each side for about 1-2 minutes. 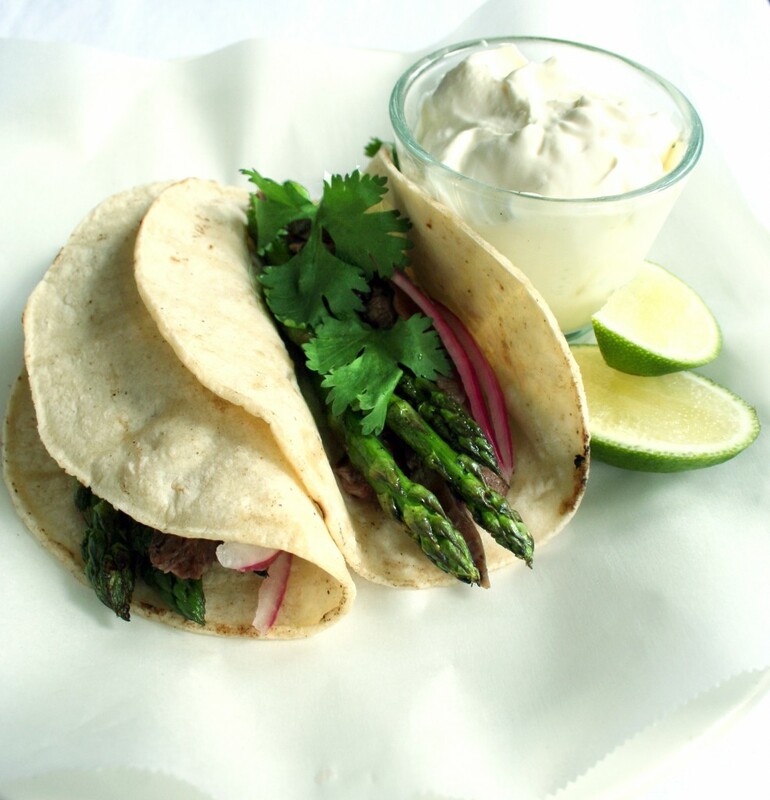 To assemble, add asparagus, sliced steak, cheese, prepared pickled onions and other toppings like cilantro, avocado or salsa to taste. Pulse everything in a blender or finely chop the cilantro and combine with the remaining ingredients. Add steak and marinade to a zippered, sealable bag. Refrigerate for 1 hour or up to overnight. Let the steak rest for about 5 minutes before slicing against the grain, into thin strips. Peel and thinly slice the onion. Place in a large bowl and pour over enough boiling water to cover. Leave for about 30 seconds and strain. Return the onions to the bowl and add vinegar, honey and salt. Toss well to combine and cover the onions. Cover the bowl with plastic wrap and leave for about 1 hour or until ready to serve. Snap woody ends from the asparagus, wash and dry well. Combine the spices, onion and mint with the ground lamb, mixing very thoroughly. Measure ¼ cup of the lamb mixture and using your hands, shape it into a rough ball. Press your finger down the center to create a crevasse. Lay one asparagus spear in and cover tightly, wrapping the lamb mixture around the asparagus, covering the tip completely and firmly. Lay finished kebab on a lined baking sheet and press down gently. Repeat with remaining asparagus spears and lamb mixture. Refrigerate for 30 minutes to 1 hr. Heat the barbecue to medium heat and grill, rotating each side for about 2 minutes, cooking for 8-10 minutes or to an internal temperature of 160ºF. 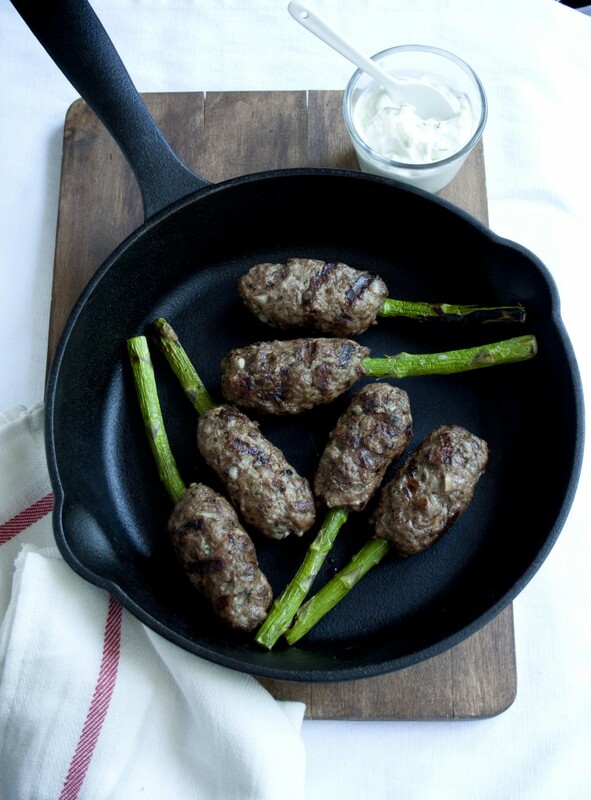 Alternatively, fry the kebabs in a non-stick pan over medium heat for 8-10 minutes, turning to brown and cook evenly. 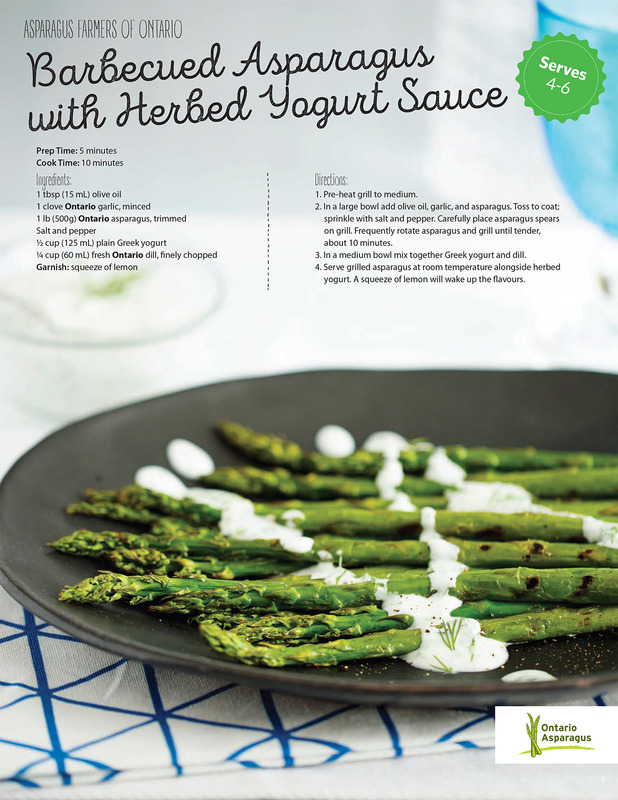 Measure the yogurt into a bowl and add the chopped mint, cumin, cayenne, salt and pepper. Peel and seed the cucumber. Grate it with the largest hole of a box grater and add to the yogurt mixture and stir well to combine. Clean and trim the asparagus. Toss with 1 Tablespoon of olive oil and sprinkle with salt and pepper. Heat the barbecue to medium and close the lid to retain the heat. Add trimmed, oiled asparagus to the grill and turn after 3-4 minutes, watching carefully not to burn the tips. Cook for about 5-8 minutes, moving the more slender spears to the top rack as they become tender. Cut the pizza dough in half. Shape and stretch the dough to make two, 10-12″ pizzas. Drizzle over about 1 Tablespoon of olive oil per side and rub in evenly to coat. Lay the greased pizza dough onto the pre-heated grill. Cook for about 3 minutes and flip once the underside has grill marks and is golden and firm. Cook the other side for 3-4 minutes then turn over again to dress your pizza. Evenly spread pesto, then dot with a few slices of slivered garlic, ricotta cheese. 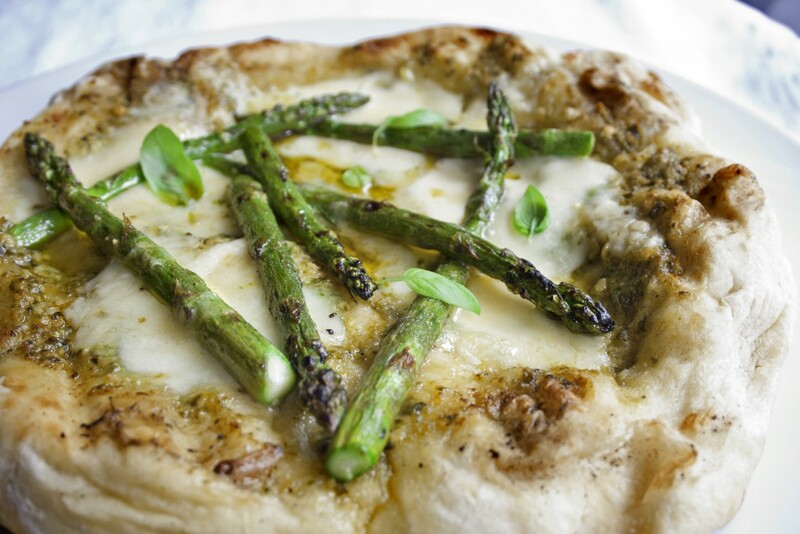 Layer the asparagus and sprinkle over shredded mozzarella. Close the lid on the grill and heat the pizza to thoroughly melt the cheeses; about 2-3 minutes more. Remove from the grill to a cutting board. Top with parmesan shavings and fresh basil leaves, if desired. 1 Tablespoon Active Dry Yeast, one 8g package? Dissolve the yeast and the sugar in the warm water and let stand for about 10 minutes or until bubbled and frothy. In a separate bowl or in the bowl of a stand mixer with the dough hook attached, combine 2 cups of flour and the salt. With the motor running, stir in the yeast mixture followed by the olive oil. Knead for a few minutes until the dough comes together to form a soft ball that is no longer sticky. Cover and rest for at least 30 minutes to rise. © Copyright 2013 Asparagus Farmers of Ontario. Site by Guardian Computing.